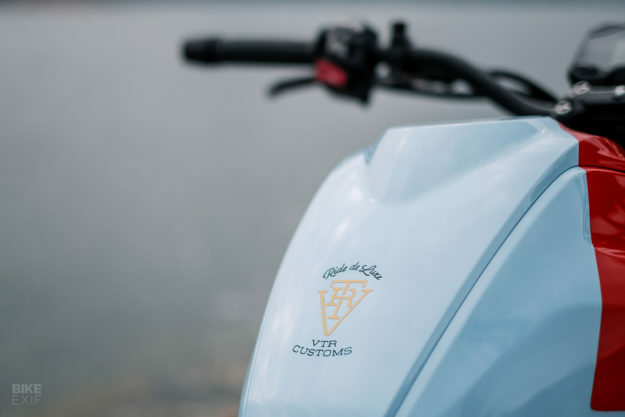 As the dedicated custom arm of a premium BMW motorcycle dealer in Switzerland, VTR Customs is used to working on high-end Bavarian machinery. 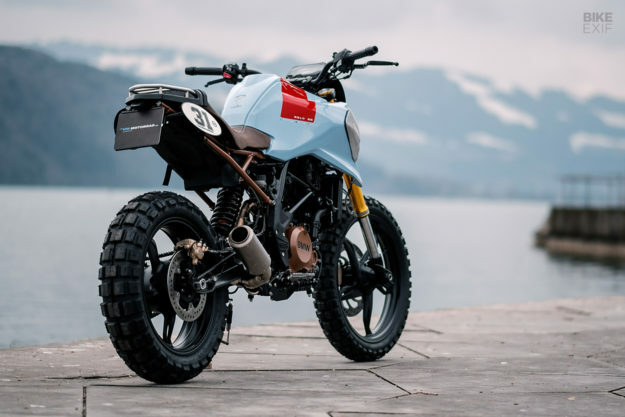 We’ve seen a number of classy BMW R nineTs roll out of their shop, and their race bikes are a regular fixture at European 1/8 mile sprint races. 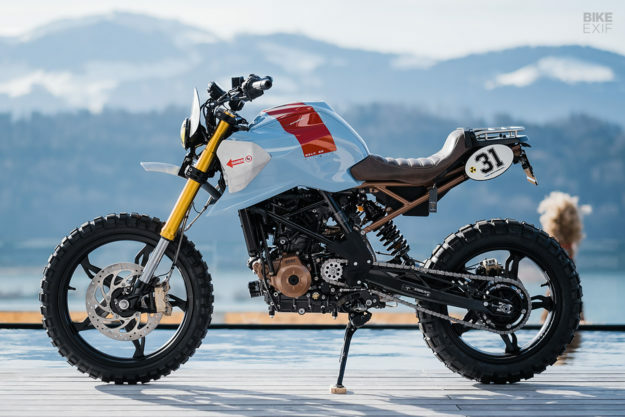 So why on Earth would they customize BMW’s littlest ‘adventure commuter’—the entry-level G310 GS? According to shop boss, Dani Weidman; for fun. 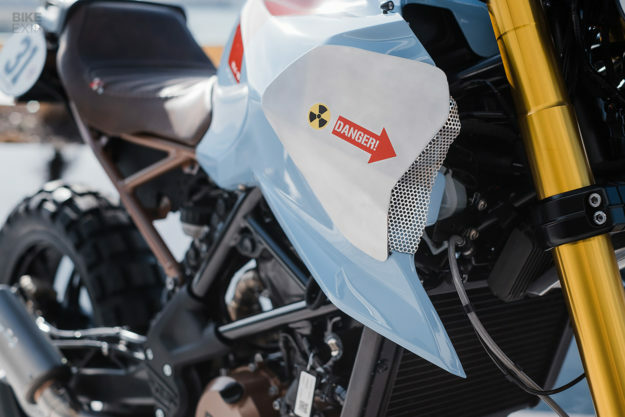 The basic concept for ‘Little Boy’s Toy’ came together quickly: a blend of classic scrambler cues, with bright colors and a playful urban vibe. 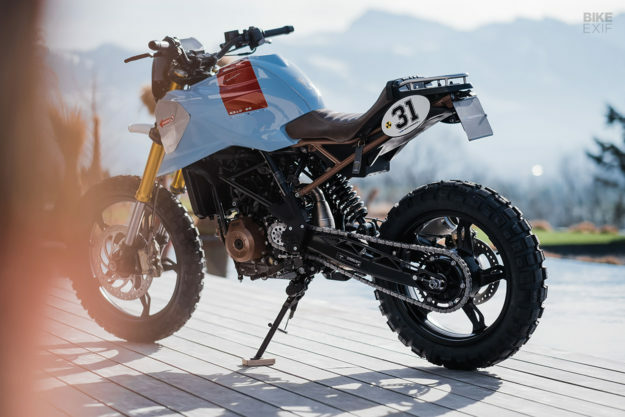 But with enough of the original ‘GS’ DNA to inspire the young—or young at heart—to leave the GPS at home, and scoot off into the great outdoors. Dani had an ulterior motive too. VTR’s newest apprentice, Nico, had yet to cut his teeth on a custom build—and the team wanted to test out his skills. “And check if there is a sparkle in his eyes when it comes to customizing,” says Dani. Once Nico and the VTR team had stripped all the 310’s stock bodywork off, their next objective became clear: put as little of it back as possible. But with layer upon layer of plastics, that wasn’t easy. In the end, they kept just the fuel tank cover panels, trimming the side sections for a more pleasing shape. It sounds like a simple process, but the guys ended up slicing up two brand new sets of plastics to find the lines. They were still left with a couple of gaping holes, and some unsightly wiring. So they tasked Nico with hand-shaping a pair of alloy side covers. After several cardboard mockups, Nico started on the final metal forms. The baby GS still needed some new bits up front. So on went a hand-made number board, a short, alloy fender, and a classic headlight, with custom brackets to hold everything. A set of number boards were whipped up for the back too, along with a custom seat pan. VTR’s upholsterer, Yves Knobel, wrapped the new saddle in a rich brown leather, with VTR’s signature color-coded ‘X’ stitches on the side. 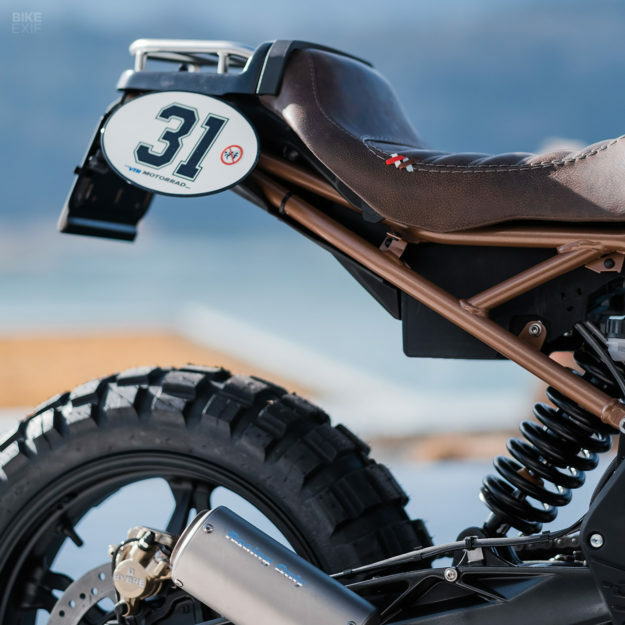 The luggage rack was borrowed from the R nineT parts catalogue—perfect for a sleeping bag. And the tail light is a pair of three-in-one Kellermann combo LEDs. 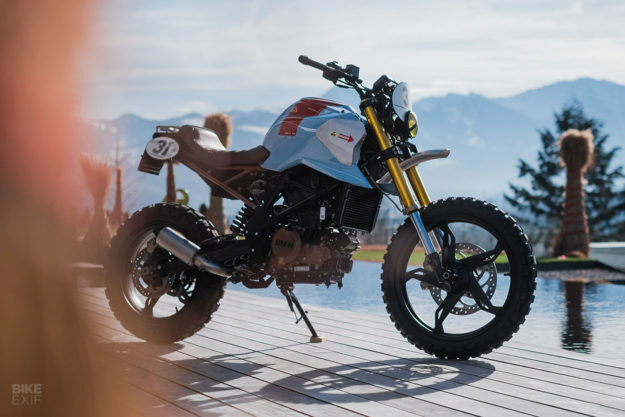 VTR handed the G310 GS over to Freuler in Benken for paint, who shot it in a sweet baby blue and red. The rear shock spring was redone in black, and the frame and engine cases were coated in the same bronze as those on the new BMW S 1000 RR. Since the stock forks were already gold, and the wheels already black, VTR left those alone. 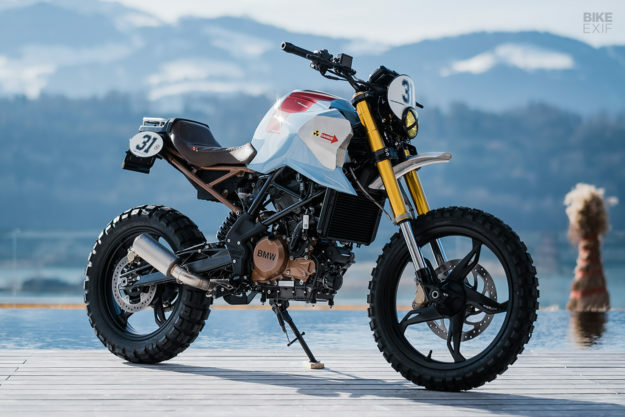 They just swapped the stock tires out for a more aggressive set of TKC80s. 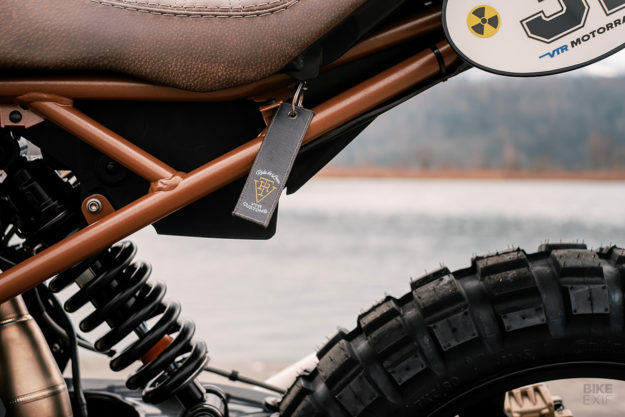 A remarkable amount of work has gone into what is essentially an entry-level bike. But Dani assures us that any notion of a build budget went out the window early on in the project. 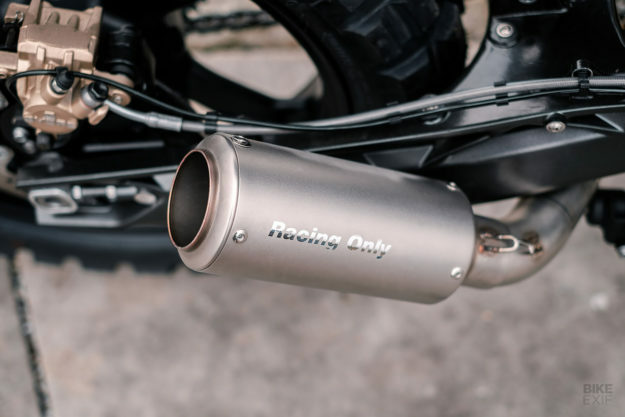 Even the exhaust is top-shelf—and with a fully open header and short end can, most definitely not street legal. 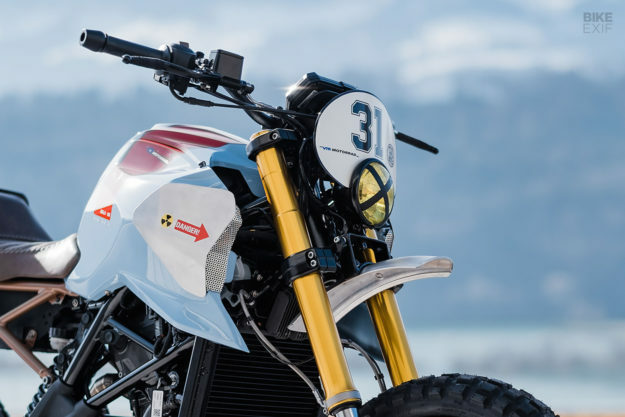 So VTR put aside a homologated Akrapovič system to go with the bike, should they sell it. And sell it they did—on the second day of the Geneva Motor Show. VTR’s stand was located between a bunch of exhaust manufacturers, and their petite G310 was making more noise than anyone else’s bikes. In no time an ex-pro windsurfer, who claims he’ll never grow up, snapped it up. It’s gone off to the picturesque Engadin Valley, where it’ll spend its days surrounded by lakes and mountains. Some guys just have all the fun!